I can Help You Avoid a Hiring Mistake! When it comes to Hiring, you can think you have done everything right. You took the time to write the best job descriptions to help you hire. You screened your applicants thoroughly, hoping to weed out any resume lies or past behavior that could signal an unsafe hire. You even made sure that the applicant you picked had a smooth transition into your company. But despite your best efforts, you are slowly starting to think you might have made a mistake. 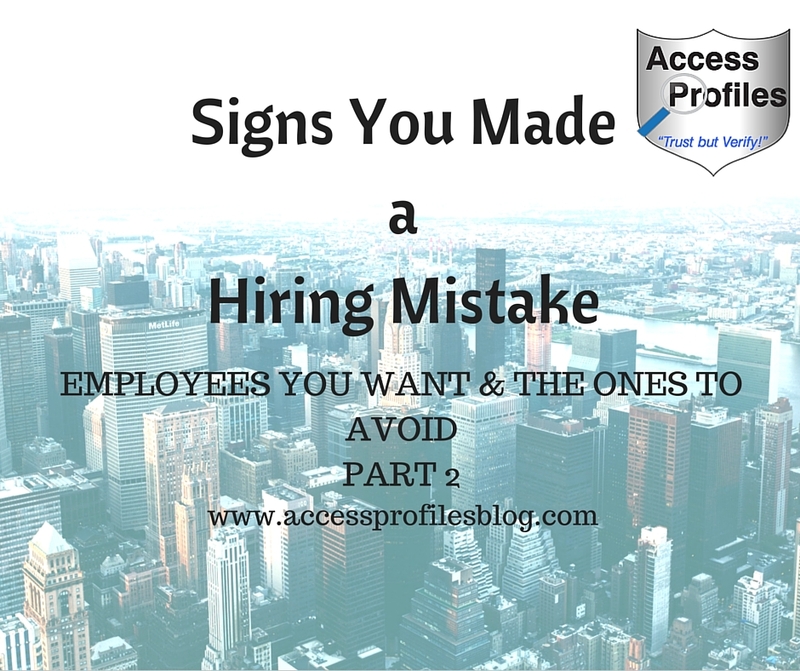 Here in part 2 of our series on "The Employees You Want to Hire and the Ones to Avoid", we will share some early warning signs to look for and what you can do to get back on the right hiring track! Most often, your first mistake is made during the interview and screening process. You may be in a hurry to hire and you become rushed. Instead of spending the time necessary to verify resumes and check details, you grab the first candidate that looks promising. This is a mistake. Taking the time now to interview and screen your applicants thoroughly can save you from major hiring headaches later. That is why it is important you recognize the potential warning signs during the interview! And your best weapon is to consistently ask the right questions and listen closely to the answers. “It is possible to spot your Best and Worst Hires during the interview and screening process. It is all about asking the right questions. Be sure to ask them and their former employers for specific examples of when your applicant worked as part of a group, spearheaded a project, or solved a problem. Listen carefully to the answers and note when they fit the kinds of traits you are looking for. Conversely, pay attention to any red flags. Any examples where your applicant is overboard on self-praise should be noted. And a past employer’s perception of them as unreliable or unproductive should give you pause." Find out more by checking out the entire article here! So, now that you know what to do during the interview stage, it is important to recognize the signs to look for AFTER you make your new hire! After the Hire ~ What You can Do if You Made a Mistake! Who Expect Special Treatment - They quickly want their job duties or work schedule changed to accommodate them. Who Constantly Complain - They are very vocal about what they see as problems. They are quick to point out ways they are being taken advantage of or being treated unfairly. This behavior can ruin company morale. Who are Doing the Bare Minimum - The best new hires want to stand out. They go above and beyond in order to prove to you that you made the right choice. If your new hire is not doing this, then you should be concerned. Who Repeat Their Mistakes - You have to expect that new hires will not be perfect. But when a mistake is pointed out to them, and the correct way to do something is explained, then continuing to do it wrong spells trouble. It shows lack of focus and commitment to doing their job well. Who are Unwilling to do things Your Way - They continue to do things like they did at their previous job or how they think is best. This can be a sign of someone too set in their ways. While as an employer, you should always be open to new ideas, being completely unwilling to adapt, without even trying it your way, should be a warning sign. Who Will Never Take the Reigns - They won’t take any initiative or jump at the chance to spearhead a new project or team. Who are the Source of Complaints from Your Other Employees - You are being bombarded by your existing workers with tales of incompetence, lack of team work, laziness, etc. While you can’t simply take these complaints at face value, you do need to check into them. Now that you have learned how to spot a potentially problematic employee, it is time to find out what you should do about it ~ and the answer to that question is really, “It Depends”! There are times that your new hire can be saved. It is possible that putting them through a re-training program will help. Or maybe you have simply hired the right person for the wrong position. In that case, moving them to a different position (if possible) can make all the difference. It is important that you are giving your new hires the tools they need to hit the ground running. You can’t expect them to be productive and fit right in if you are not willing to take the time to help. That means careful and well-thought out on-boarding. Be sure to use established and detailed training programs. Make them as specific to your new hire’s position as possible. If your on-boarding and training processes are up to par, then it is possible that taking the time to re-train your new hire will put them on the right track. It may be that your new hire has the skills they need to do the job, but they just don’t seem to fit in. They may not understand or gel with your company culture. Or they may simply be too unsure of themselves. Either way, you have to decide if taking additional steps is worth it to keep them. If you choose to try and work it out, then finding them a mentor to help them during their transition is a great step. Having a mentor gives your new hire an immediate close contact within your company. It provides them someone to go to with questions where they won’t be judged. This can make all the difference. Made a Hiring Mistake? I can Help! However, there are other times when it is better to cut your losses and let your new hire go. And once you have made the decision that this course of action is best, then it is crucial that you take the time to do it right. It starts with a one on one with your new hire. Be completely open and honest with them about why it is not working out. Be ready with clear examples of problems you have observed about their job performance. Avoiding accusations and personal attacks is key. It is also important you give your new hire the chance to provide any mitigating circumstances that can explain their behavior. It is possible that their answers may provide you with some insight that could alter your decision to let them go. No matter what you decide, it is absolutely necessary that you document the entire conversation and any previous actions (re-training and/or mentoring for example) and subsequent decisions made concerning your new hire. You should also keep detailed records of all performance reviews and any steps taken or directives given to your employee to remedy the problem. This will help protect you and your company from a potential lawsuit. In fact, it should be done for all your employees at all times! Even when an employee is new, or still in their probationary period, this is important. You must have records documenting everything from their initial interviews, to their hiring, to their work while with your company, and this includes the steps you take before letting them go. Once your problem employee is gone, you will once again need to hire. And it is key that you learn from your previous mistakes or risk making a bad hire all over again. Remember, any hiring mistakes you make will cost your small business not only time, but money. Evaluating what you are doing now and how you can make your hiring process better in the future makes good business sense. 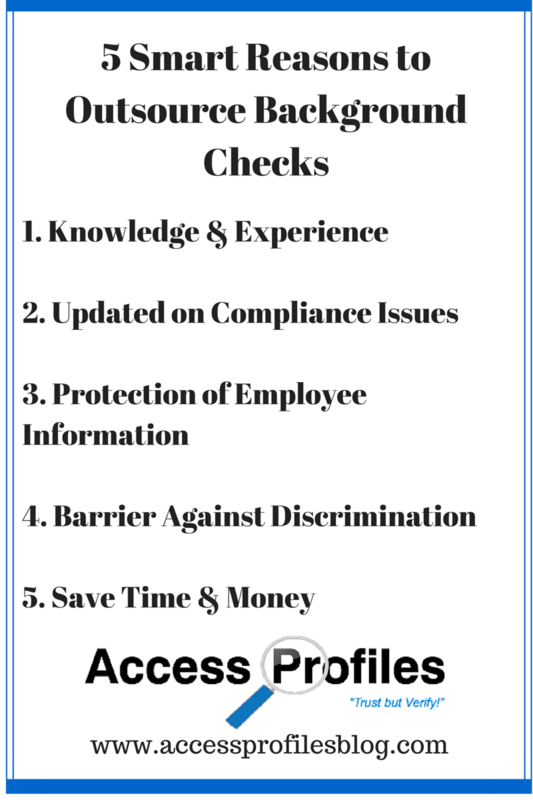 “One Size Does not Fit All ~ Why You Need to Fit the Background Check to the Job”! Now you are armed with the information you need to hire right in your Small Business. In Part 1 of this series you learned who to hire and who to avoid. And here in Part 2 you have discovered the steps you can take if you have already made a hiring mistake. Using these tips will help you hire with success! 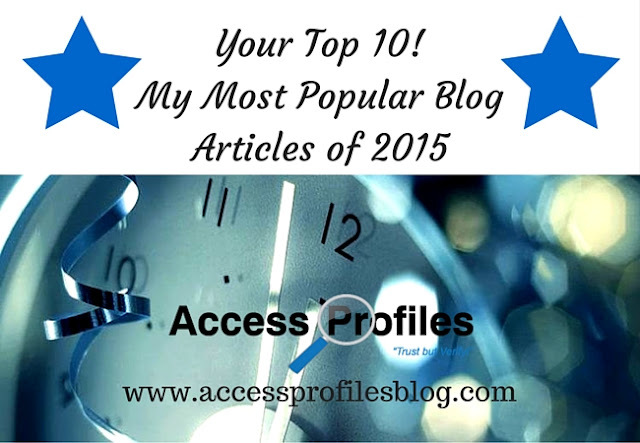 Please Pay it Forward and Share this article on your favorite social sites! We would also love to hear your own hiring stories. Comment Here! Thanks! Contact Us Now! API can help you Hire Right in your Business! Find out What I can Do to Help You Hire Right! Get Your Hiring Questions Answered! Resources and Frequently Asked Questions or Contact page. You can also find out more About Us and our Hiring, Business Mentoring, and Security Consulting services! Hiring for your small business is a big step. It shows that you are doing something right when it comes to running your business. But no matter how exciting this step can be, it is important that you go into it with your eyes wide open. Over the past few weeks we have focused on various things you can do make sure you hire right. We have shared the Importance of Writing Good Job Descriptions for your open position (Part 1 & Part 2), Your 2016 Hiring Checklist, and the reasons to Verify your Applicant’s Past Employments. 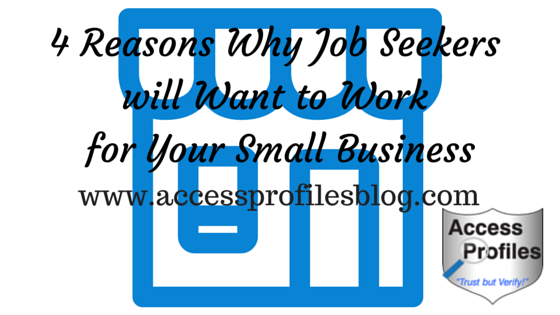 Now it is time to focus on the employees that will help or hurt your small business. 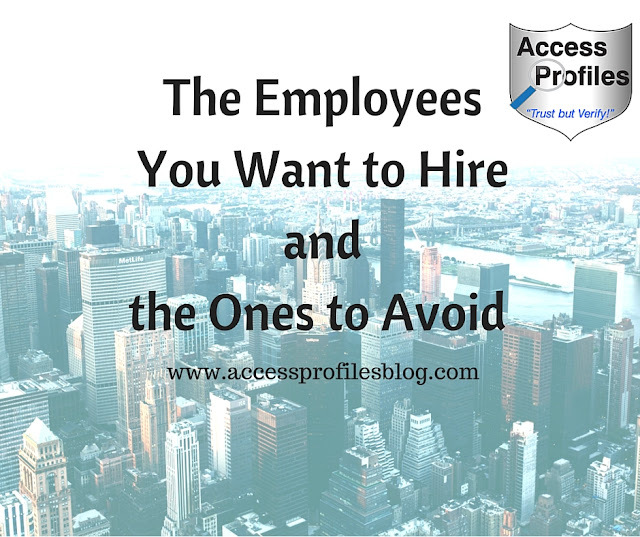 In the first installment of this 2 part series, you will discover both Who to Look for and Who to Avoid when it is time to hire! A Leader ~ Someone who is willing to take charge, whether it is of a team or on a special project. They don’t shy away from responsibility. Look for someone who has already proven they have this skill. This information can come from a former employer (good reason to not skip those employment verifications) or even from a project or club they spearheaded while in college. A Teammate ~ Someone who is willing and able to work collectively. They will care about your other employees and about your company as a whole. Team players are not just focused on how they perform, but how the group performs. Just like the Leader, you need this type of employee to make your small business work. An Innovator ~ Someone who is creative and strategic in their thinking. They are capable of looking at things “out of the box”. They are willing to not only embrace new ways of doing things, but are also able to suggest them. A Problem Solver ~ Someone who can evaluate a problem and find a solution. A strategist. Problem solvers can think quickly and are willing to take decisive action. They know exactly how to use what they have to make things happen. An Independent Thinker ~ Someone who is able to look at something with a new perspective, a different way of doing things. They are great at critical thinking. Their biggest asset is that they are not willing to simply go along, even if it is against popular opinion. A Flexible, Multi-Tasker ~ Someone willing to work beyond their job description and take on additional tasks. This type of employee can adapt to changing demands. This is especially important in a small business. Many times you may not be able to hire as many employees as you might need. It helps when fewer employees are flexible enough to cover multiple tasks. Now that you know the type of employees you want in your Small Business, it is just as important that you know the types of employees to avoid. A Sheep ~ Someone who blindly follows. They have no original thought. They never think to ask questions or try to find better ways of doing things (the complete opposite of the Independent Thinker). A Loafer ~ Someone who is inherently lazy. They won’t do their share, but love taking the credit, especially when it comes to group work. You often find them away from their desk or “on break”. This type of employee can create resentment since your other employees often have to carry their work load. An Egotist ~ Someone who makes everything about them. A narcissist. They have a hard time getting along with your other employees and can’t truly succeed at team work. Their only focus is on the “me”, not the “we”. A Finger Pointer ~ Someone who will never Own their own Mistakes. They are always ready to accuse others instead of taking responsibility for their own actions. A Person Set in their Ways, an Obstinate ~ Someone who is close minded. Who fights change every step of the way. Employing too many of these types will keep your business stagnant. 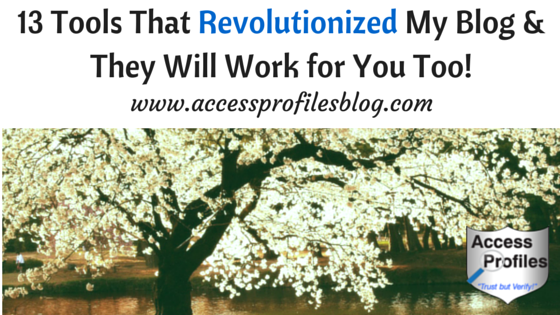 You need people willing to help your business evolve and grow. It is possible to spot your Best and Worst Hires during the interview and screening process. It is all about asking the right questions. Be sure to ask applicants and their former employers for specific examples of when they worked as part of a group, spearheaded a project, or solved a problem. Conversely, pay attention to any red flags. Any examples where your applicant is overboard on self-praise should be noted. And a past employer’s perception of them as unreliable or unproductive should give you pause (you will learn more about warning signs of bad hires in Part 2 of this series). 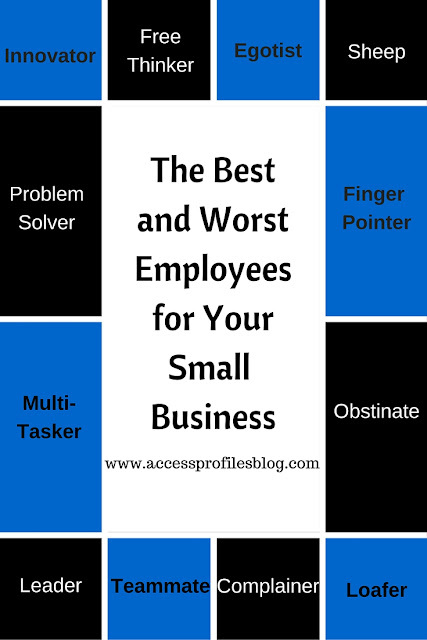 Now you know what types of employees to look for and what types to avoid hiring in your small business. In Part 2, we will explain what to do if, despite your best efforts, you find yourself having made a hiring mistake! We can help you hire in your Business! Get Your Hiring Questions Answered. Resources and Frequently Asked Questions page or Contact Us. Business Mentoring, and Security Consulting services too! Checking Past Employments on Your New Hires Makes Sense! 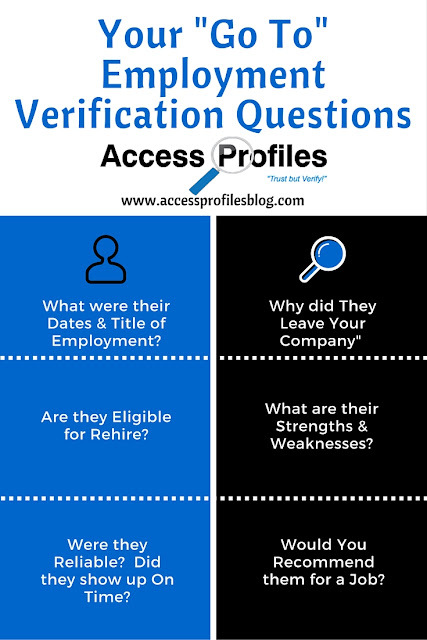 Do You Do Employment Verifications on Your New Hires? As a Small Business owner, you already recognize the value of screening your new hires. You understand that knowledge is power and hiring with your eyes wide open makes sense. 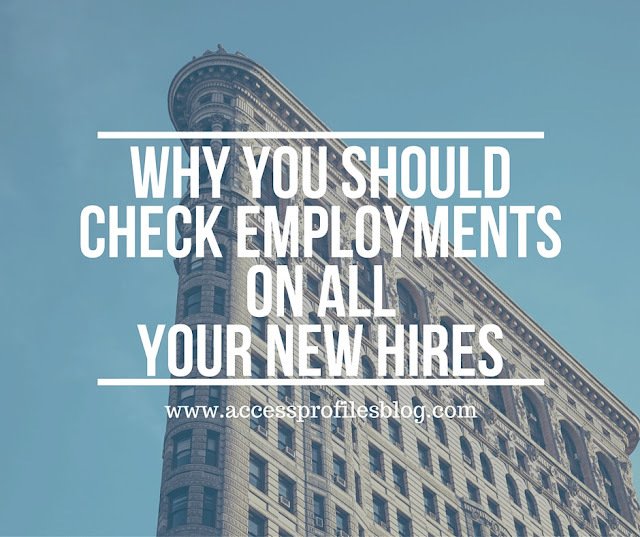 But did you know that checking past employments should be an important part of the equation? There is valuable information that can be discovered when you take the time to verify employments. In fact, one of the biggest mistakes you can make is to assume that there is very little beyond dates and title of employment to find. Here you will learn Why You need to do Past Employment Checks and Share What You can Really Find Out! Many are under the assumption that companies are prohibited by law from verifying anything beyond the very basic information on their past employees. This is not true. As long as they are not fabricating anything, they are free to share both positive and negative comments about their past employees’ job performance. However, companies are prohibited from outright lying ~ and doing so can put them on the wrong end of a defamation lawsuit. Because of this, employers are understandably cautious. And many times you will encounter employers who cite “company policy” as a a reason to release only the bare minimum. Despite this, if you know how to ask the right questions, you can discover so much more! For example, it is possible to uncover that your applicant was terminated instead of having resigned. Or that your their job performance was not up to par. It all comes down to what questions you ask and how you ask them! What You Need to Do ~ Ask the Right People the Right Questions! If you want to get the information you really need from an Employment verification, you first need to go to the best sources. And that is not the Human Resources Department. Instead, work hard to contact your applicant’s direct supervisor or manager. Speaking with someone who worked closely with your applicant is key. They will have the real information you need to make a good assessment of your possible new hire. Once you reach the right person, then it is time to ask the right questions. The Employment Questions You Need to Ask! Dates and Title of Employment ~ Start off easy with verifying your applicant’s dates and title of employment. You may even want to contact HR first just to get this basic out of the way. Reason for Leaving ~ Finding the true circumstances under which your applicant left their previous position is valuable. Were they fired for cause? Did they leave under good terms? Discovering the true reason your applicant left makes sense. This is not always a negative. Many times a previous supervisor will be happy to share that your applicant left to better themselves. This is the kind of thing you want to hear! Eligible for Rehire ~ “Are they eligible for Rehire?” is my favorite of all the employment questions I ask! Many times I have gotten an answer to this question even when company policy dictates they only supply dates and title of employment! And their answer can say a lot! If there is no negative reason why your applicant left, your source will usually answer with something like “Yes, we would love to have them back” or “Our policy is to not rehire when someone leaves us, but I wish we could”. However, if there is cause why your applicant is no longer working there, most times the answer to this question is a curt sounding “No”! Performance ~ Asking a question such as “What are their Strengths and Weaknesses”? can yield some valuable information to your hiring decision. If possible, follow up with a request for any specific examples they are willing to share. Their former supervisor’s insights can help you determine whether these qualities could make a good fit in your small business. Reliability / Attendance ~ Knowing whether your applicant can be counted on is key. Asking “Did they show up on time when scheduled?” or “Would You Consider them Reliable?” makes sense. Would You Recommend this Applicant for a Job? ~ Committing or, in some cases not committing, to a recommendation is a big deal. When your source is willing to go on record either way, then that should say a lot to you about whether this is the hire for you. Making Employment Verifications a part of your screening process can yield information valuable to your hiring decisions. And, the more information you have, the better. As always, Knowledge is Power. 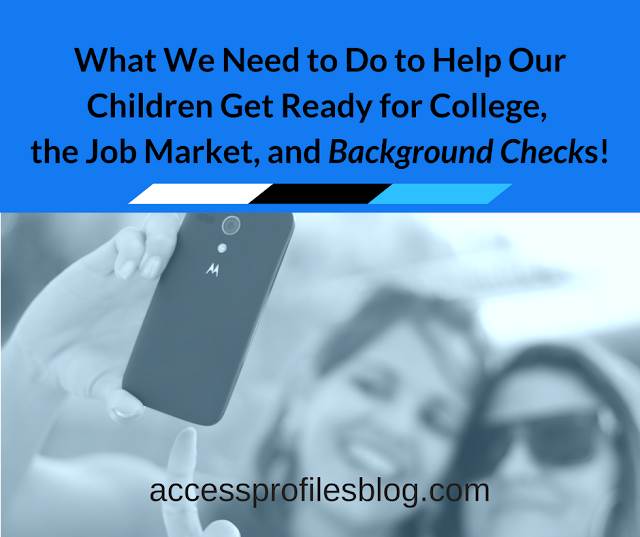 Using a good background check company to help you in your hiring process makes sense. And this is especially true when it comes to using Employment Verifications. The benefits are twofold. First, a good background check company will take the time necessary to contact the best sources. Second, they will also be practiced in How to Ask the Right Questions to obtain the quality information you need. And, after all, Hiring Safely and Effectively should be your ultimate goal! Please Pay it Forward and Share and Comment on this article! Thanks! 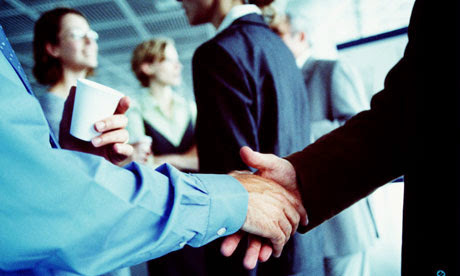 We can help you develop a sound and effective Hiring Policy tailored to Your Small Business! Find out more About Us and our Background Investigation too. We can also answer your top Hiring Questions (visit our Resources & Frequently Asked Questions page to find out more). It is the start of another year, and you have worked hard to make your small business a success. You may have increased your client base or are contemplating expanding your products or services. The potential for increased workload has you thinking about how you will handle the volume. Now is the time when you should plan for possible new hires. That may be full time hires or even part-time or temporary hires. Each type of hire has their own set of pros and cons. Learn more in “Is Your Company Ready to Hire? 10 Tips on When & How to Do it Right!”. But no matter which type of hire you choose, pre-planning makes sense. And the time is Now to get Your Small Business Ready. 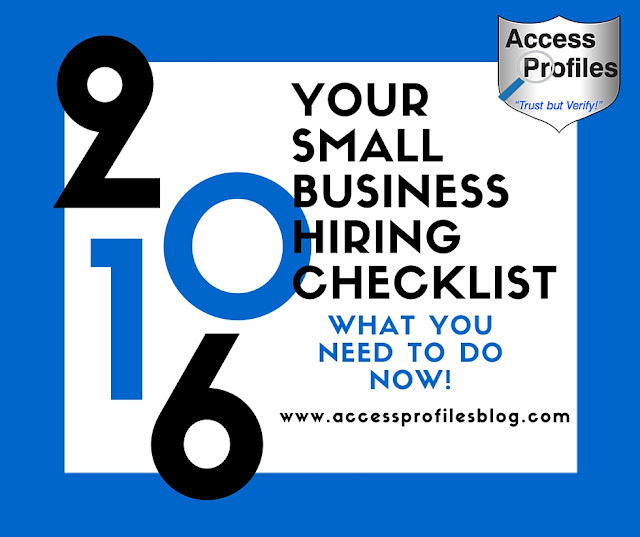 This Small Business Hiring Checklist will help. Your hiring strategy should include criteria that determines when and how to hire and your company’s goals. For example, you can set hiring parameters such as, “I will hire when my workload or that of my employees increases 5-10%”, or “I will look internally for promotions, then replace at the entry level”. Whatever you choose, it is important to really think about what will work for you and your company. Being proactive and creating your hiring strategy long before you really need it is key. Putting it off is risky. Not only will you have to scramble to get one in place under pressure, but you will most likely be adding to your strained workload or that of your existing employees. Taking the time to write the best job descriptions for your small business makes sense. And once again, it is best to start this long before you need to hire. When done right, a good job description will not only help you hire the best candidate, it will also help promote your company brand. Your job descriptions help you hire by being specific about the skills and experience you need for your positions. It will also help any potential job seekers know exactly what will be expected of them. In addition, by using key words and phrases, you will be able to convey your working atmosphere and company culture. Both are an important part of your Small Business Brand. You can find out more in Part 1 and Part 2 of my series, “Job Descriptions ~ How to Write One and Why it is Important to Do it Right!”. As a small business, you will be competing for top talent not only with other small businesses, but also with big business. In order to attract the best hire, you should focus on what makes your company unique. Don’t fall into the trap of trying to compete directly with what larger businesses can offer. Instead, focus on creating the right company culture. Develop ways to ensure talent is rewarded. Keep in mind what employees really want, and find a way to meet their needs. Take into consideration what is really relevant to their lives. And salary is only a part of it. Consider offering flexibility that addresses their personal needs, tangible rewards for good work, and even possible work from home opportunities. Remember, “Small Businesses get it wrong. Many think that because they are small, they have less to offer their new hires than the big companies. Because of this, they often settle for what they can get. It is time to change that mindset.”! Read more ways to set your small business apart in “4 Reasons Why Job Seekers will Want to Work for Your Small Business”! 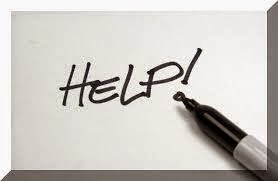 Before you hire, you will also need to address issues that govern the hiring process. There are local, state, and federal legislation you will have to consider. In addition, EEOC (Equal Employment Opportunity Commission) guidelines must be addressed. A big part of this concerns your applications and applicant’s rights. Your application, both paper and online, is most often one of the first introductions a job seeker has to your company and your open position (after your “help wanted” posting). It is important that it is clear and concise. Your application should request basic personal identification and contact information. It should also ask for information related directly to the job you want to fill. 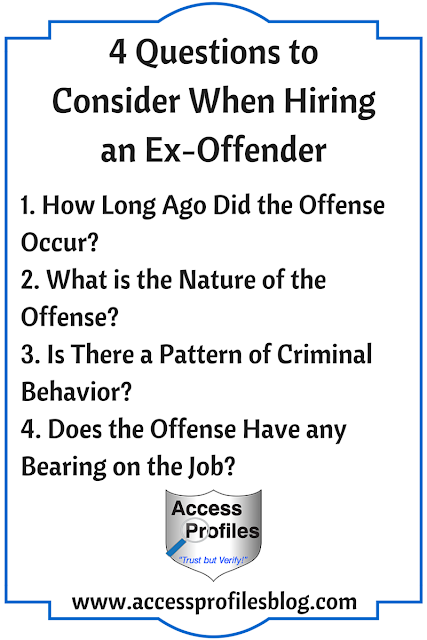 What it should not contain is any question concerning your applicant’s possible past criminal history. This is where “Ban the Box” comes in. Many states and localities have passed legislation that prohibits you from asking your applicants about any criminal history early on in the hiring process (with many more sure to do so in the future). Continuing to include this question on your application opens you up to potential EEOC lawsuits. You can discover more about “Ban the Box” in “Don’t Roll the Dice ~ Why You Need to ‘Ban the Box’ Now!”. 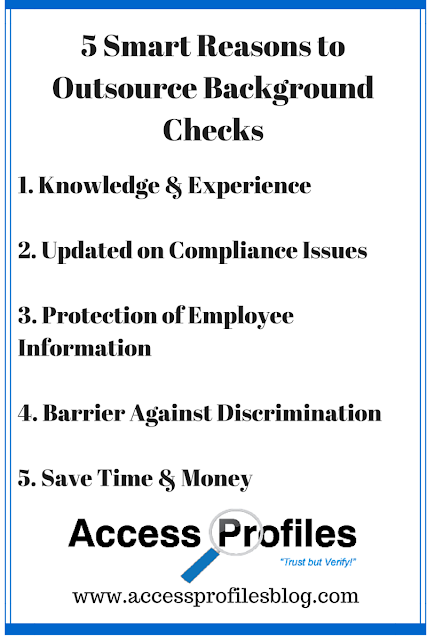 Your job applicants have rights when it comes to the employment background check. 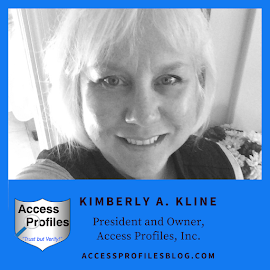 It starts with you having to fully inform your applicant that a background check will be done, only proceeding after obtaining a signed release from your applicant, and informing your applicant, in writing, of their rights concerning that background check. According to the FCRA (Fair Credit Reporting Act), you must inform applicants that an employment background check will be done during the hiring process. This disclosure must be given in writing and it must be in a “stand alone” document. This means it cannot be contained within your application or background check release form. 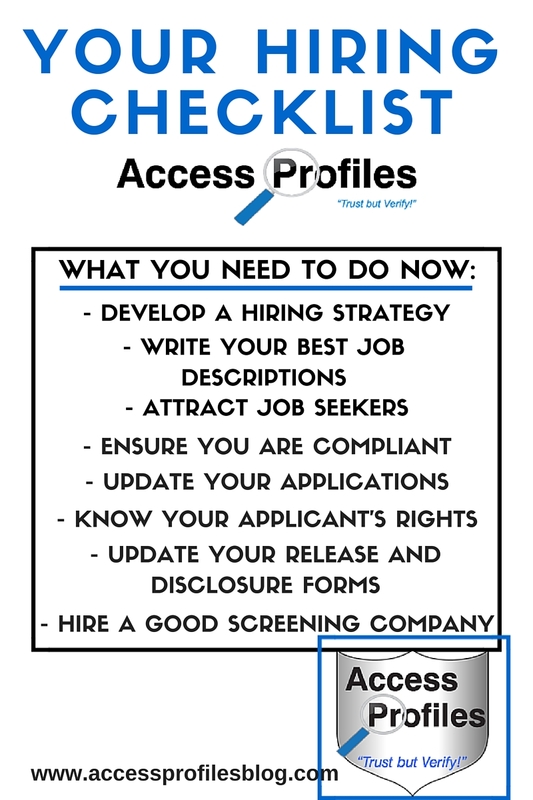 To keep up with these hiring and compliance issues, you should consider hiring a good screening company to help. Choose one that will work with you, as a partner, to keep you up-to-date with ever-changing hiring regulations and that will focus on your specific needs. Read more about why hiring an outside screening company is good for your small business in “5 Smart Reasons to Outsource Your Background Checks”. Following this checklist will help get your Small Business ready to hire. And the time to start is NOW! Contact Me Now! I can help you set up a hiring policy that will work for you!